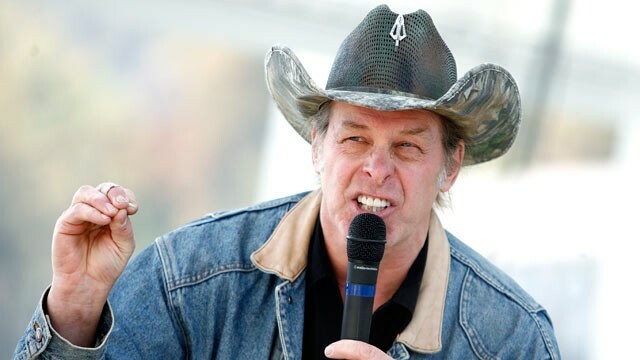 Some have said that Nugent’s comments were threats being made to the president, I don’t know about that. When I first heard about the comments I will admit I was like WTH is he talking about chopping heads off??? Then I decided to look up the video and listen to the comments on my own and come to my own conclusion. I can see how people could misconstrued Nugent’s comments but I read it as a man who simply hates President Obama and wants to see a change in government. When he says, “We need to ride into that battlefield and chop their heads off in November…”. He does not ACTUALLY mean killing anyone, he is referring to electing a new Executive gov’t in November. Don’t get me wrong the language is strong and hateful but the outcry is a little bit over the top. The Liberal media has to be careful as I can’t recall much of a defense of Dubya while entertainers took their shots. What I will say is that Mitt Romney should distance himself from Nugent, like Obama had to distance himself from Jeremiah Wright and Louis Farrakhan in 2008. There is just no room for a presidential candidate to allow a “supporter” to speak like that on his behalf. “The issue has been resolved” and the agency “does not anticipate any further action,” Secret Service spokesman Brian Leary told the Washington Post. Either justice on Earth, or justice in Heaven. It’s coming! Excellent post. I was checking continuously this blog and I am inspired! Extremely helpful information specifically the final phase 🙂 I care for such info much. I was looking for this certain information for a long time. Thanks and good luck.